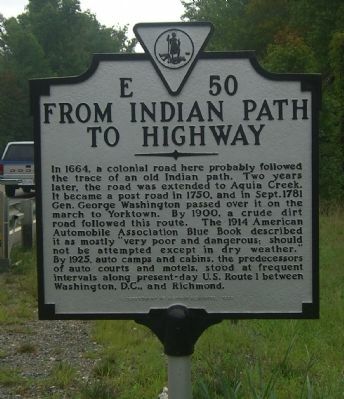 U.S. Route 1 originated as an Indian path that Virginians later followed and made into a main transit road north to south from Aquia Creek to around present-day Fredericksburg. In the beginning of the 1900s, Route 1 went by the name Richmond-Washington Highway. The US General Assembly approved the establishment of the first state highway system in 1918. At this time the Richmond- Washington Highway was a muddy and bumpy ride. In 1918, the road was mainly gravel and dirt except for a small section near Alexandria which was made up of concrete. As with most gravel roads of the time, traveling was dangerous and slow, especially in foul weather. Route 1 was fully paved in 1927 (A History 27). Interstate 95 was built to lessen the flow of traffic on Route 1, which during the 1950s was a main transit route. The first section of Interstate 95, bypassing Emporia, was completed and opened on September 8, 1959 (A History 29). U.S. Route 1 is still functioning today and is a crucial road in and out of Fredericksburg. Needless to say, the highway maintenance and techniques have been adapted over the years and U.S. Route 1 is much safer and more convenient than it was during its humble beginnings as an Indian path. Historical Marker Database, “From Indian Path to Highway Marker,” http://www.hmdb.org/marker.asp?marker=2188 (accessed April 10, 2008). A History of Roads in Virginia: “The Most Convenient Wayes.” Richmond, VA: Virginia Department of Transportation, 2006. Pawlett, Nathaniel Mason. “A Guide to the Preparation of County Roads Histories.” Charlottesville, VA: Virginia Highway and Transportation Research Council, 1979.—— “Early Road Location: The Key to Discovering Historic Resources.” Charlottesville, VA: Virginia Highway and Transportation Research Council, 1980.